So my boss sends me to Florida to attend a conference on short notice. He's the boss, so I go. My flight is an hour late, and flight attendant declines to check the connecting flight status for me, so I have no idea whether I'll be stranded in XYZ airport, because my connecting flight is the last one out. This did little to improve my already cranky mood. Once in XYZ, I discover that my connecting flight is two hours late, and so not only will I be catching it (w00t! ), but I will even have time to have a snack and a drink before boarding starts. I race to the nearest in-terminal restaurant, plop myself on a stool at the counter and ask for a beer and any food they can get me in the next 10 minutes. The barkeep gives me options, and I settle on a Bass and a quesadilla. While she's taking my order, I perceive an accent and ask her if she speaks Russian. She does! We start talking in Russian, and she says that I can have a shot on the house. Wow! That is way nice. 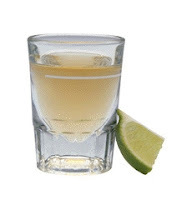 I ask for a tequila, and seconds later, there it is, twinkling at me from a shot glass. I down it, bite the lime, and immediately the world starts turning into a better place. The food arrives, and it tastes great! I have no idea if it was objectively great, but I was hungry, and this quesadilla seemed like the finest food I ever tasted at the time. The bartender and I chat some more, then I head for the gate with a grin on my face. Once again, a proof that there isn't a situation which cannot be improved with addition of alcohol.